Mancala is the oldest known game in the world. Learn more about Mancala, a word that derives from the Arabic word naqala, literally meaning "to move". Mancala is one of the oldest games still played today. In fact, it dates back to sometime between 500 and 700 A.D. It's no surprise that a game with thousands of years of history can be played many ways. People throughout Asia, Africa, North America, the Caribbean, and the Baltic region of Europe may have some varying mancala rules, but the most popular one in North America is known as Kalah. Whether you play with seeds and holes in the ground or a nice wooden board, mancala is a great way to sharpen your thinking skills. To learn all the important mancala rules you need to win, keep reading below. Mancala has existed for thousands of years because it's easy to play. You don't need extravagant equipment to enjoy this game. You can even play without any materials at all. The fancier versions of mancala involve manicured wooded boards with pits carved out. The common Kalah board has two rows of 6 pits arranged parallel to each other, as well as two larger pits at either end. The nicest mancala sets use shiny pebbles to deposit in the pits. If you don't have an official mancala set, don't fret. You can simply dig holes in the ground and use seeds to play with. If you're creative enough, you could find many different resources to use to play this great game. The smaller pits should have an equal number of pieces in them - usually about four. The larger pits, however, are left empty. The goal of the player is to gather more seeds in their pit than their opponent. Although this game is intellectually challenging, the gameplay is quite straightforward and simple. Players simply take and deposit their pieces into the pits sequentially. Where the game gets tricky is in the strategy. Players should strategically choose their pit during each turn. Then, they deposit each piece - one by one - into each pit in a counterclockwise direction. Make sure not to skip the large pits during a turn. A player can continually deposit pieces if their last piece lands in a pit with other pieces in it. Those pieces are picked up and the cycle of depositing continues. It will not end until the last piece lands in a pit with no pieces in it. Players should be careful which pits they choose as the goal of the game is to get more pieces in their designated, large pit. If a player winds up without any pieces on their side of the board, the game ends. Any pieces leftover on the opposing side will go to that player. Ending up without pieces will usually lead to a loss. Mancala rules and gameplay are so cognitively stimulating that teachers often use it in their mathematics classes. It's a perfect game for anyone who wants a little challenge with their recreation. 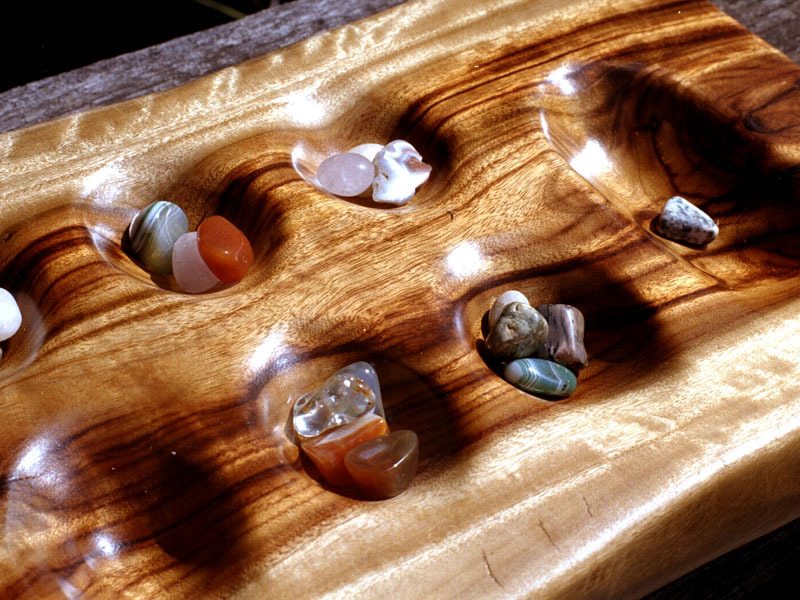 To get started with your first, official mancala board, don't forget to stop by our page! Why is Mancala Fun For All Ages? ©2018 Mancala Games. Powered by Blogger.